I may have grown up in a house where my dad was a chef (definitely not a vegan one) and I do feel very naive for saying this, but I didn’t realize how much fun and engaging a cooking class could be! It’s only taken me…oh…almost 30 years! 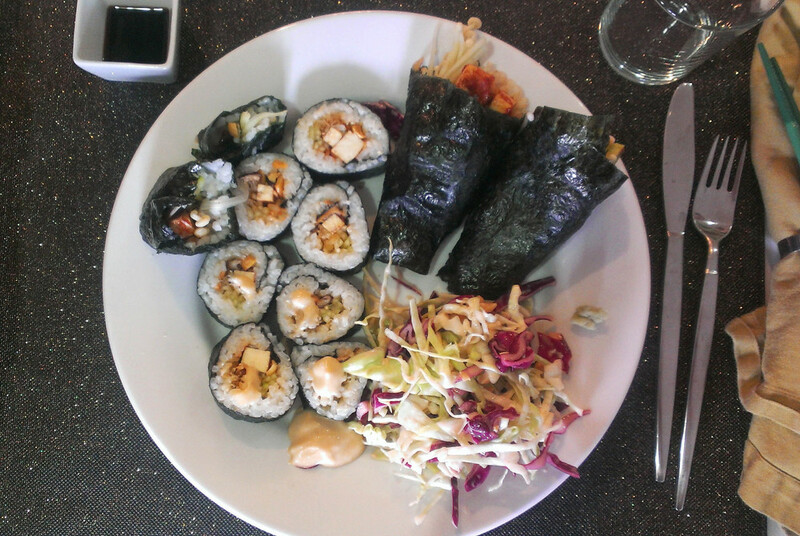 I think it had to be the right combination–vegan, sushi and a pair of lovable sister chefs, to ignite a growing enthusiasm to expand my culinary skills. We all know I’m a nutrition enthusiast and I create 90% of my meals, but out of habit I usually stay within my comfort zone. I don’t stray to far unless I’m “eating out the fridge” and then I have to get pretty creative. This class energized me. I left feeling like a sushi chef ready to work at a 5 star sushi restaurant. Ok ok, I may be exaggerating a tad, but I was feeling great about what I was learning, retaining and creating. Prior to me becoming that 5 star sushi chef (or just having the ego of one), I was a young gorgeous (hee hee) lady walking into her first Spork Foods vegan cooking class in West Hollywood. 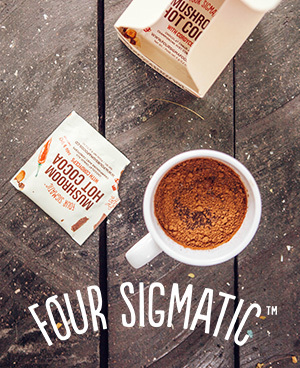 Spork Foods is a Los Angeles-based gourmet vegan food company, run by the talented sister duo Jenny Engel and Heather Goldberg. 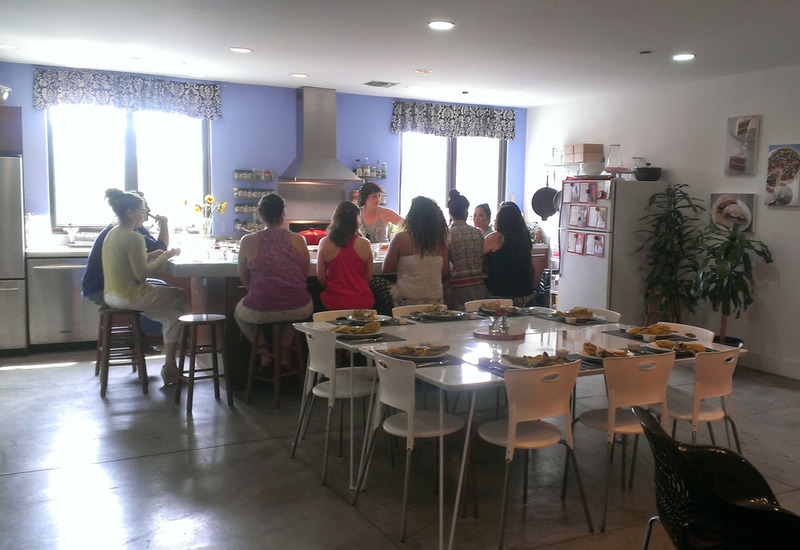 Just one aspect of Spork Foods is vegan cooking classes but they are multifaceted and also engage in; In-home consultations, private cooking parties, corporate training’s/demos and team-building cooking classes. 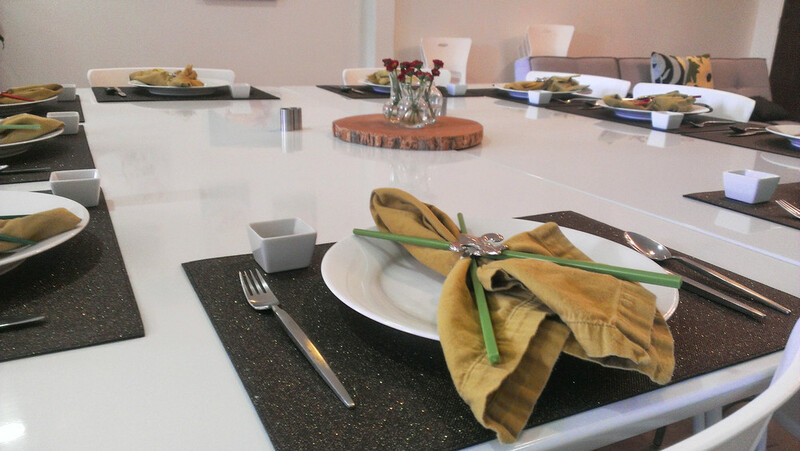 While entering their West Hollywood studio, I walked past a gorgeously prepared table set for the end of class. I could tell by the table, the studio and the kitchen they were well versed in their attention to detail. "A clean kitchen is a happy kitchen." I just made that up and I’m loving it. Spread it around like wildfire. This class was comprised of 10 people. Some return customers, some new. Thanks to social media, I happen to have known a few of the individuals. Three San Franciscan vegan bloggers were down here for the weekend on a their own self created food tour. Amazing, right?! 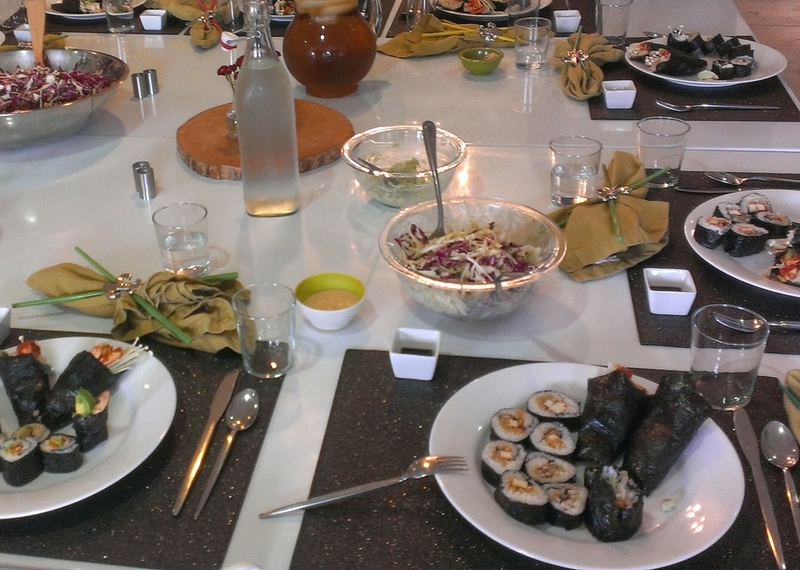 The size of the class fit perfectly around the kitchen counter and later proved to be even more useful when it came to the preparing of the sushi. 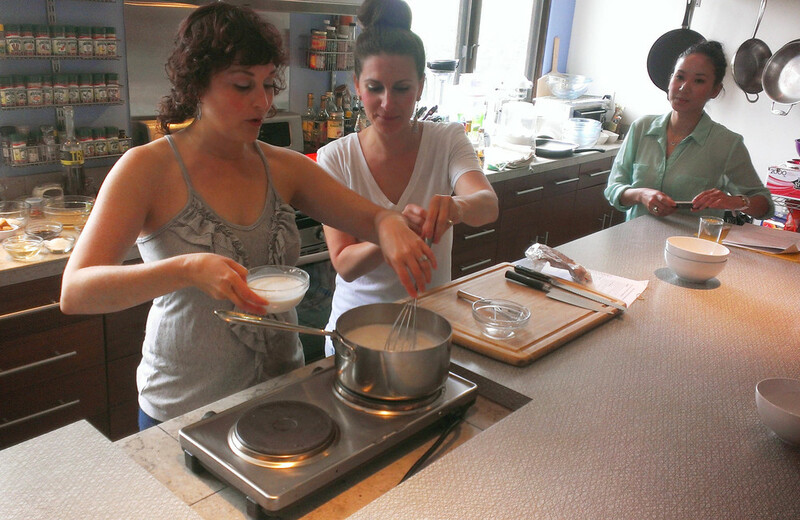 As the class began I was happily surprised at the quality of the ingredients they used. No skimping here. They pulled out the products I would have used. They took time to pass around the products and inform the class on why they choose what they choose. It was smart and informative. When it came to preparing the food they used two techniques; they demoed and then they had us participate. Class was well thought out ran smoothly. The parts where we engaged made sense and the parts where they needed to take the reins were spot on. For my part, when preparing both hand rolls and cut rolls, I never realized by glancing at them the delicate technique involved. There are hidden tricks, correct measurements and an air of finesse when creating these unique creatures. 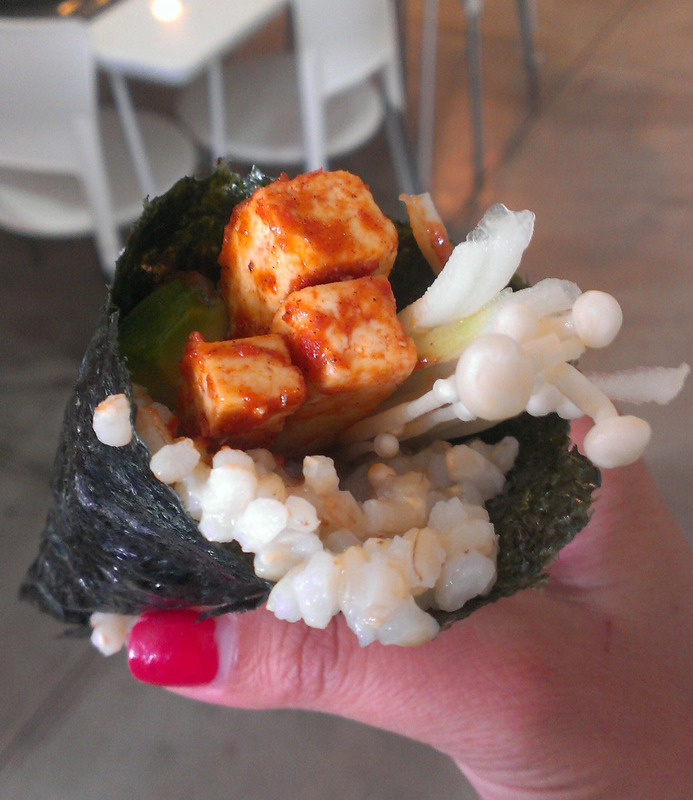 I was pretty proud of my hand roll and my cut rolls. We took our stunning plates over to the set table and sat down for a friendly feast. After our wonderful lunch, Jenny and Heather brought out the coconut ice cream with yuzu caramel sauce for dessert.. Delicious! and the perfect ending. The whole experience was exceptional. I’m going to be presumptuous and say we all had a blast, enjoyed the meal fully and left with new knowledge we didn’t have prior to entering. I can say from my personal experience, I feel I am a little ahead of the curve when it comes to nutritional knowledge, but I am humble enough to know that there is so much I am still needing to learn and explore. From the giant takeaways of this class to the little bits of info that blew my mind, I am highly impressed by these two wonderful sisters. This would be a fantastic addition to add to your mix with your friends, your family, a significant other or a day date! Check out their calendar for a list of their upcoming themed cooking classes like Mambo Italiano, New York Deli, The Ultimate Brunch, Vegan Pig Out and Dim Sum. I mean, how cute and fun do these sound?! We can all relate to wanting to learn more on how to veganize key favorites or just wanting to find a healthier option to our favorites. I could benefit from all of their classes but one that really hits home is dim sum. It’s so complex, so intricate and so meat/seafood heavy. I grew up going to dim sum on Sundays. Learning some vegan dim sum techniques would be an evolution in my vegan-culinary journey. I can’t wait for my next cooking adventure!